We know it can often be a night-marish scenario for vehicle owners to learn that their transmission must be repaired or replaced. It’s essential to know that your mechanic understands what he is doing with modern transmission rebuilds. We also specialize in manual clutch-style transmissions along with the automatic transmissions most newer vehicles have. We can clean, repair, rebuild or replace most modern transmissions, transfer cases, differentials, and electronics systems. As one of the more intricate components of the drive train, the engine’s transmission impacts nearly every other element in the modern engine. Let our NAPA Certified mechanics run computer diagnostics on your transmission system to efficiently and accurately assess any problems or areas for concern. 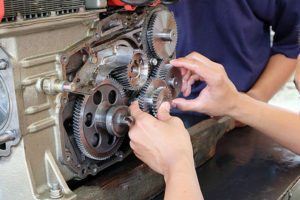 From mild diagnostic adjustments to rebuilding or machine-correcting the gears themselves, we can do it all. We are reliable transmission repair specialists, but that doesn’t mean anything if we don’t stand by our work. Ask us about how we stand by our diagnosis and repair work, and offer full warranty on all our repairs, rebuilds and new transmission installs. We appreciate the cost of work like this, and we want to make sure the money you spend ensures reliable transportation. Then with proper diagnosis, we can get right to the heart of the problem with your vehicle’s transmission. From slipping gears to damaged transfer cases, our diagnostic systems will find the problem quickly, so your cost can be focused on the actual fix and not hours or days of troubleshooting and diagnosis. Contact us to schedule a transmission diagnostic test if you think you are having problems with your vehicle’s transmission system.